Product prices and availability are accurate as of 2019-04-18 16:48:38 EDT and are subject to change. Any price and availability information displayed on http://www.amazon.com/ at the time of purchase will apply to the purchase of this product. For more than 5,000 years, Ayurveda has been used to promote health and well-being throughout India. Now, people all over the world are discovering its health benefits and incorporating Ayurveda Benefits techniques and remedies into their daily lives. Replacing your ordinary water glasses with our Indian Copper Cup Water Tumbler is one simple way that you, too, can begin using the principles of Ayurveda Benefits and healing in your home. 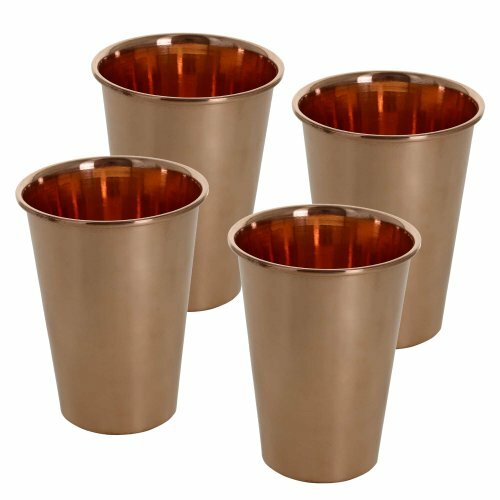 According to Ayurvedic traditions, copper cups are the best choice of vessel for water glasses. That's because drinking water from copper cups allows you to receive the natural benefits of the copper mineral. Ayurvedic practitioners state that drinking water that has been left in a copper water tumbler over night can assist with digestive function, weight loss, wound healing, heart health, brain function and skin health. On top of that, copper cups simply look attractive and offer a unique alternative to traditional water glasses. Our Indian Copper Cup Water Tumbler is made with traditional handcrafting techniques that have been used to produce copper cups like these for generations. The copper cup holds 400 milliliters of water and measures 4.5 inches in height by 3.5 inches in diameter. 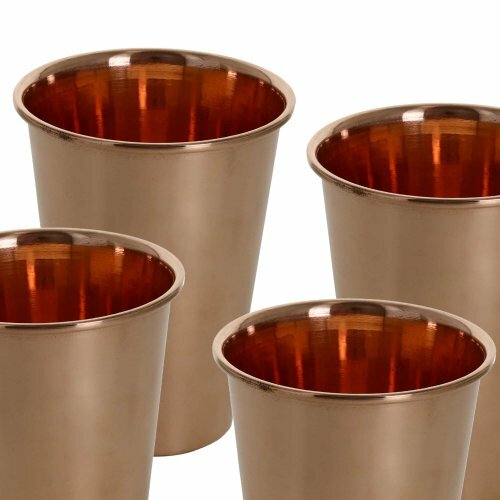 Recommended only for drinking water, these water glasses are constructed from 100 percent pure copper and are not coated or finished with any type of material. This allows you to enjoy the full benefits of drinking water from a copper cup; however, it also means that frequent polishing and cleaning will be required to maintain the lustrous finish of the water tumbler. Discover the benefits of Ayurveda Benefits and healing remedies or simply enjoy a drink of refreshing water in a unique new way. Order the Indian Copper Cup Water Tumbler today, or change the quantity in the drop-down box to order more than one of the copper cups!